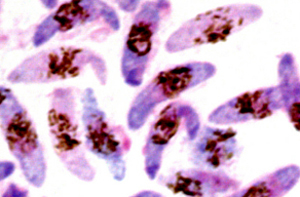 Researchers at the London School of Hygiene & Tropical Medicine found Plasmodium falciparum malaria parasites with a mutation to the gene Ap2mu were less sensitive to the antimalarial drug artemisinin. A study in 2013, also led by the School, suggested an initial link between a mutation in the ap2mu gene and low levels of malaria parasites remaining in the blood of Kenyan children after they had been treated. However, further research was needed to confirm if these genetic characteristics represented an early step towards resistance. In the new study, researchers genetically altered the malaria parasite in the laboratory to mutate ap2mu in the same way that had been observed in Kenya. They found the altered parasite was significantly less susceptible, requiring 32% more drug to be killed by artemisinin. The genetically altered parasite was also 42.4% less susceptible to the traditional antimalarial drug, quinine. Earlier this year a different research group discovered mutations in the gene kelch13 which were linked to reduced susceptibility to artemisinin combination treatment in South East Asia. Historically, resistance to antimalarial medicines has emerged in South East Asia and then spread to Africa. But these new findings suggest a different route to drug resistance may be developing independently in Africa. Lead researcher Dr Colin Sutherland, Reader in Parasitology at the London School of Hygiene & Tropical Medicine, said: “Our findings could be a sign of much worse things to come for malaria in Africa. The malaria parasite is constantly evolving to evade our control efforts. We’ve already moved away from using quinine to treat cases as the malaria parasite has become more resistant to it, but if further drug resistance were to develop against our most valuable malaria drug, artemisinin, we would be facing a grave situation. The World Health Organization estimates more than half a million people die from malaria every year, mostly children under five. Plasmodium falciparum is the most deadly form of the malaria parasite.